Do people really want to pay with cryptocurrency? Some make an argument that people see cryptocurrency as a long term investment and don’t want to spend it on daily items, others say that merchants might be reluctant to accept crypto due to the regulatory uncertainty, yet other say that people are unlikely to pay with crypto due to its volatility. Truth is, they all have a point and there will be limiting factors on crypto for payment adoption (at least for some time). However! We want to point out that GRAFT’s main purpose in life is not crypto acceptance per se – but providing a decentralized credit/debit payment network alternative that doesn’t rely on issuing banks and spreads the fees across the network. Crypto acceptance makes a good first use case, but it doesn’t end there. From the user’s point of view it’s a way to have an alternative to traditional credit / debit cards with underlying privacy, reasonable rates, loyalty program consolidation, etc. Firstly, Graft is not a “Crypto POS” it’s a decentralized payment network that can be used at the POS or as an online payment gateway. We don’t need the widespread adoption of Cryptocurrency as a medium of exchange for the Graft Network to be successful. For example, if the Graft Network ‘today’ was doing just 0.1% of the Visa Network’s transaction, then Graft SuperNodes would be returning close to 300% pa ( SuperNode owners would make exceptional income from SN rewards, thus the Graft price would rapidly increase). However, keep in mind that we are not just going after Visa, we are going after Mastercard, Amex, Diners, Paypal, Western Union …the list goes on. 2018 has seen a rise in the popularity of stable coins to address the volatility issue. There are now over 57 Launched or pre-launched stable coins. Because Graft is a payment Network, not just a payment processor ($GRFT coin acts like a utility token and becomes a gateway to accept other Cryptocurrencies) – so the Graft Network could, in theory, facilitate payment from any cryptocurrency, thus there’s no reason it can’t support a whole basket of stable coins (it just requires the backing of an exchange broker/ liquidity provider). There are also new gen coins coming out with Inflationary monetary policies (eg GRIN) which are designed for the purpose of becoming a medium of exchange (to mimic fiat currencies) . Soon the volatility risk or purchasing/receiving Crypto payments will be a thing of the past. 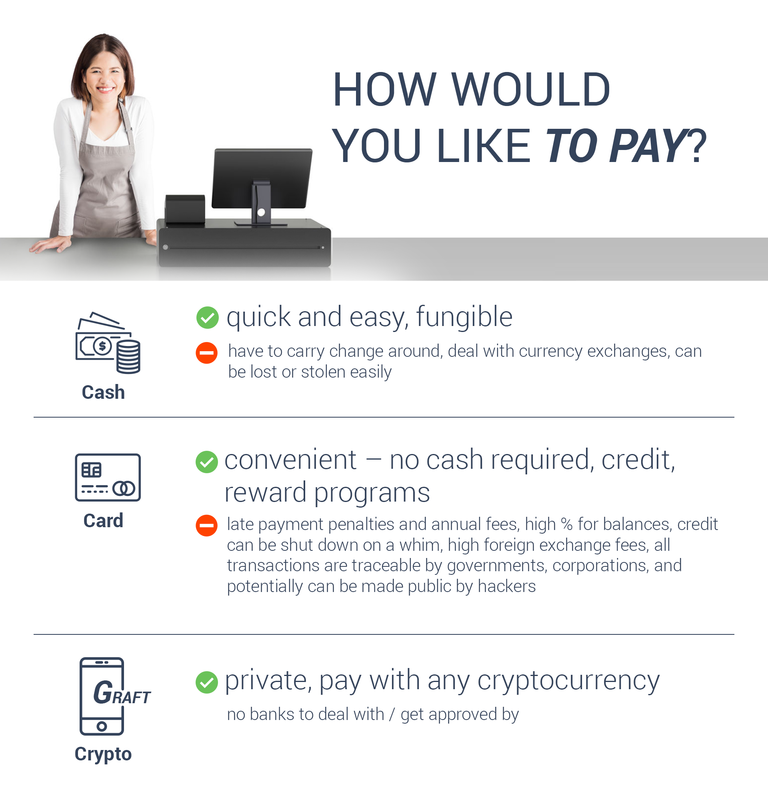 Merchants will also be incentivized to receive Cryptocurrency due to lower fees…. As for consumers: A lot of people have this US/western mindset and still have lots of faith in government-backed fiat currencies. However, go ask the people of Venezuela, Argentina or Turkey how safe they feel holding their own Government backed currencies. If you look through the history of fiat currency, they always collapse/end in hyperinflation. It’s just a matter of time. Sure, widespread adoption of cryptocurrency as a medium of exchange could be years or decades away. However, as already mentioned, we don’t need widespread adoption for the Graft Network to be successful, we need less than 0.1% (between Visa/ MC/AMEX/ Dinners etc).